STORMWATER - THE LAST WORD? 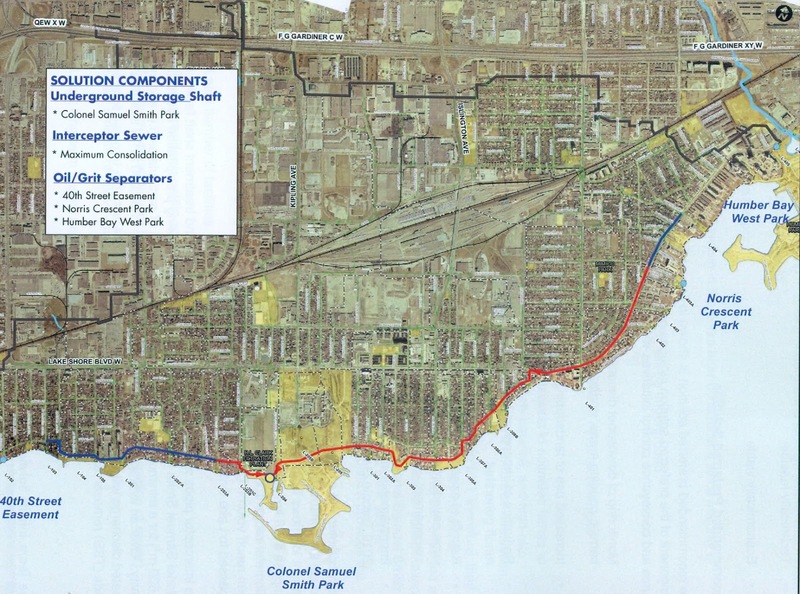 Here is a quick overview of the recommendations from the South Etobicoke Stormwater Management Plan that has now virtually cleared the Environmental Assessment. The full Study Report can be read online here. See images below. In essence, there will be an underground settling shaft adjacent to the filtration plant fed by east and west interceptor sewers that will be constructed along Lakeshore Blvd, Lake Shore Drive and Lake Promenade to capture and convey stormwater from outfalls along the Etobicoke waterfront. The Sam Smith Park section of the sewers will be tunneled. The rest will be "dig and cover". 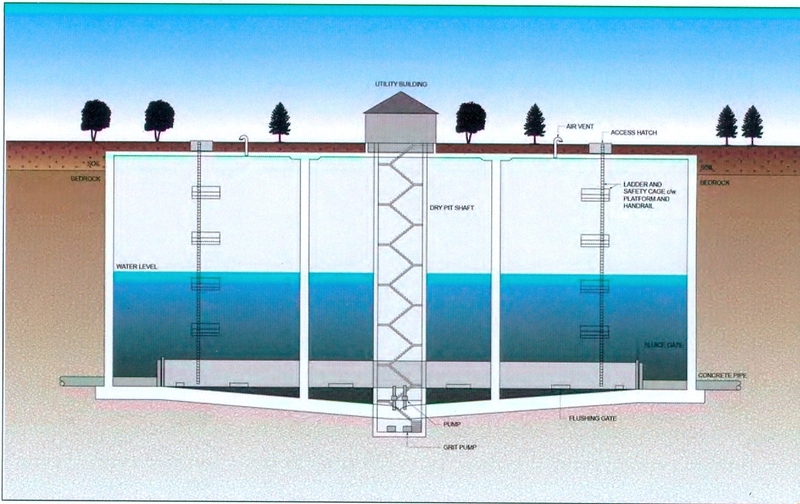 Treated sediment will be periodically removed from the shaft and transported by trucks that will enter and leave the facility through the filtration plant. Buried in the huge project file is a tiny section on enhancement “opportunities” with a small paragraph that says that during the detailed design phase there will be “considered” the “discharge of treated water from the underground treatment shaft ….. to North Creek to help restore base flow to the creek and increase opportunities for aquatic life”. 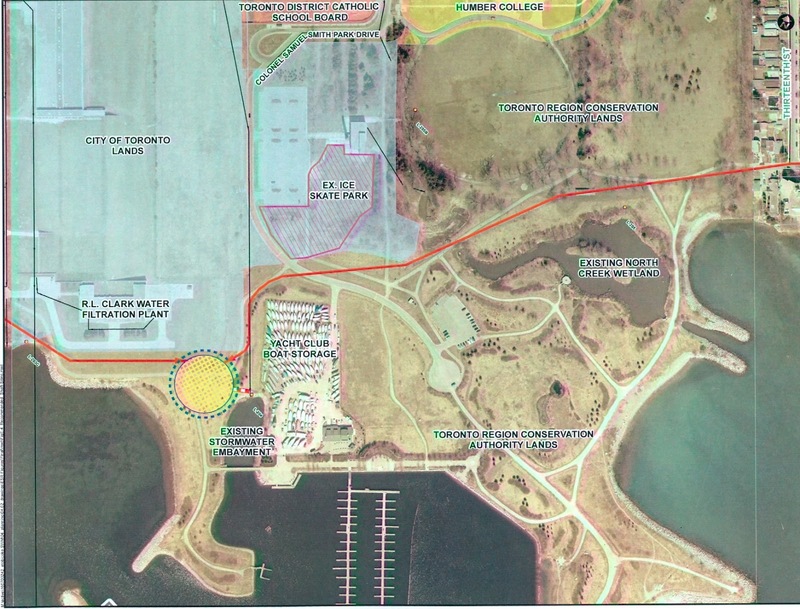 If this were to happen, The City would have to consult with TRCA and we understand that dialogue has started. The project file, however, disappointingly states, “indications are that this opportunity is limited”. This is a far cry from a naturalized solution to cleaning up storm run-off that many community members wanted and is practiced in many places elsewhere. There is no decentralized spreading out of the load, no additional wetland or settling ponds, no habitat enrichment, no daylighting of buried creeks, no water features or water runways, no imagination and no enhanced opportunity for people and wildlife to enjoy and benefit from any rainwater flowing through our neighborhood that had the misfortune to fall on barren cement and asphalt. 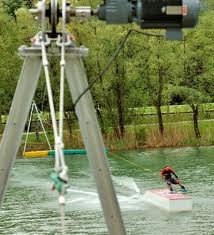 "CABLE WAKEBOARDING" AT SAM SMITH STOPPED IN ITS TRACKS! Some of you have heard rumours that the Councillor’s office was recently approached by Water Ski Wakeboard Ontario with a proposal for a wakeboard cable installation in the lagoon at Colonel Samuel Smith Park, along the very eastern shore of the marina. The proposed cable wakeboarding system involves two towers and a cable that runs between them powered by a motor that pulls wake/surf boarders through the water at high speed. Typically, this high activity sport includes flip stunts as well as jumping off of ramps etc. Click here to view a short video of this sport from the manufacturer of the proposed system. “All along the marina shore, particularly that shore, is prime nesting and fish breeding habitat. Can you imagine what impact that would have on park wildlife? 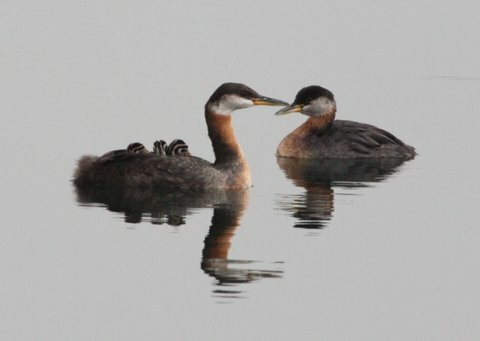 TRCA have been trying for ages to establish a breeding programme for Red Necked Grebes and, guess what, to everyone's delight, this year the birds finally bred - in the same area the wakeboarders are wanting to use!! The large kites used by the kiteboarders are already a problem to park breeding birds. When they dry them out by hovering them in the air over that same nesting habitat, they must seem like the predator from hell as they circle overhead. I haven't had the opportunity yet to survey our mailing list about this, but, without hesitation, I can assure you that there would be an outcry against this activity in our nature park, especially considering the master plan's emphasis on quiet, passive recreational use and all the work TRCA have done and money spent to create the wetlands and shore habitat. “Colonel Sam Smith Park is known as a bird sanctuary, as such the would be somewhat incongruous with the intent of the restored area. The park is home to passive activities for the most part. It is very gratifying indeed to see Councillor Grimes’ strong support of the Friends of Sam Smith Park position that Sam Smith Park is a “nature” park for passive recreational use. This proposal illustrates the need for vigilance, however. There are others out there who don’t understand the uniqueness of our park and the special purpose it serves those who love it and the wildlife that call it home. There will always be eyes on our quiet sanctuary! Josh Vandermeulen is a serious birder, travelling more than 50,000 kilometres this year to document 344 unique species, setting a new record for the number of species seen in Ontario in one year. "Where you and I see a bunch of birds, he sees red-necked grebes, pied-billed grebes, Nashville warblers, and ruby-crowned kinglets." 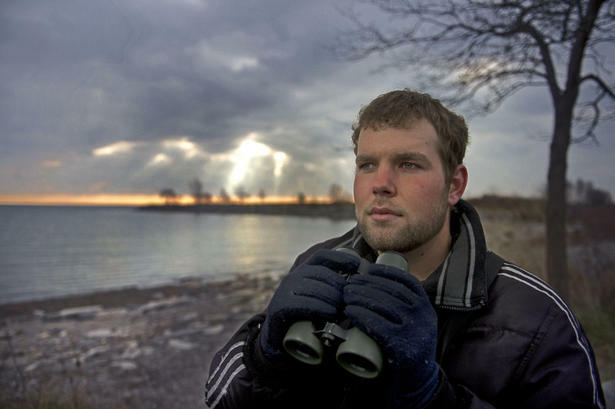 "These birds are all around us and so many people don’t notice even the more common birds,” Vandermeulen said in an interview at Colonel Samuel Smith Park in Etobicoke, one of his birding spots.